Drive it on the Street! Since SEMA, the work load has been spread between making last-minute changes to the bodywork and the Bill Of Materials (BOM) to get the car production-ready, and getting the show car ready for licensing in California via the SB100 or “Special Construction” law. That’s right…this means we’re making the Catfish street legal. SB100 makes 500 vouchers available each year for specially constructed cars to be licensed through this program. 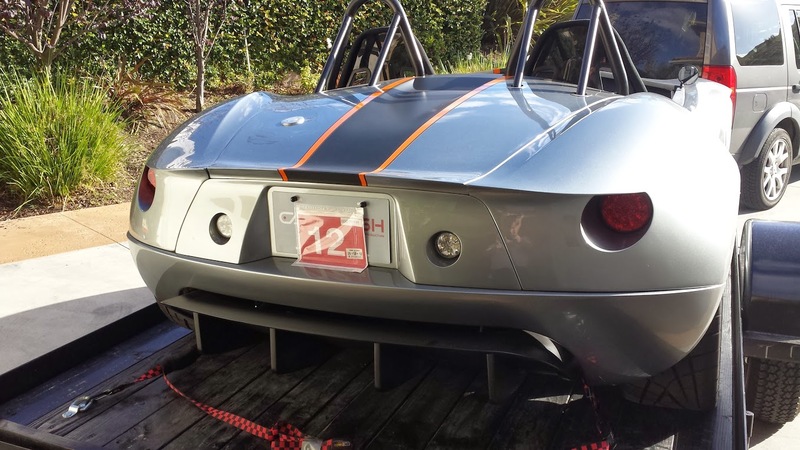 Home built cars, kit cars and other “fall through the cracks” cars such as the Ariel Atom fit into this category. Once upon a time all 500 of the vouchers were snatched up on the first day of the year, but now it seems that the rush is over and vouchers are easily available in California. The process can seem daunting, and frankly many of the DMV employees don’t know how the process works–mainly because so few vouchers run through the system. Luckily I found a step by step list that not only helps the owner (me), but also the DMV employees by listing all of the paperwork required, and the order the steps need to be taken to get a car licensed. The bottom line is that California wants your car on the road and legal…they love those fees and taxes! In addition to a couple of DMV visits, there is a CHP visit for VIN numbers (check for stolen parts), a lights and brake check and a BAR emissions visit to check for general engine compliance. The BAR visit used to be for emissions only and was mainly a formality; even a turbo-powered car with no catalytic converter would be allowed to be licensed. However, California is still considered the most strict state for registration and nothing should be taken for granted. Now for those of you who are in the “Al Gore School of Climate Change”, don’t fret. On any given day there’s more pollution caused by the leaf blowers in my neighborhood than is caused by every SB100 car for an entire year. These cars are usually show cars, or may be driven only hundreds of miles a year. And most are kept in great shape by their owners. Update: This temporary tag has been replaced with a REAL CALIFORNIA LICENSE PLATE! We’re legal! When do I get to go for a ride? Thanks for the DMV info. I actually paid a visit to the local CA DMV and found needed they quite a bit of info. I was worried about the voucher limit, but the kind lady behind the desk said don’t worry… they’re all still there. I wasn’t sure if she was referring to that office or California, but it does seem they’re readily available. It’s great to hear about the street-legal status! I’m getting excited about building one! saw your car at C&C in Irvine. I am local in San Diego. When can I come by take a closer look? Still interested to see the car. Lookin’ good Cord! If I ever get back to considering a kit car this would be my first choice! It looks great, performs great, and is realistically priced. No new posts does not necessarily mean no new news. To get an insiders perspective just sign up for the newsletter. Copyright © 2019 Bauer Ltd . All Rights Reserved.